A major part of the success of the comfort of MURRAY SPACE SHOES is found in the taking of a proper cast of the feet. The finished footwear is only as good as the quality of the cast of the foot, which is a three dimensional form-replicating procedure. The MURRAY SPACE SHOE shoemaker takes time to do a very good job of casting your feet. Everybody's feet are as different as their faces. No one particular technique of casting will properly replicate every person's foot. 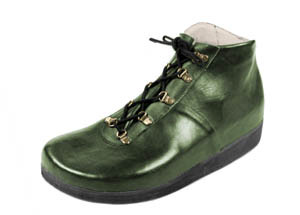 But, the MURRAY SPACE SHOE shoemaker has the experience to accommodate the best technique for the individual customer, so that the best possible shoes, boots and sandals can be made. The MURRAY SPACE SHOE takes time to talk directly with the customer and listen to his or her special needs in order to provide the customer with quality service from start to finish. This prevents the garbling or loss of communication, which can be associated with a third party process. This, also, helps to control the cost to the customer, because a third party or middle person usually adds on another 30% to 50% or more to the cost of a product. Therefore, it is imperative for you to visit with your MURRAY SPACE SHOE shoemaker for your casting and first order. This is absolutely necessary for us to make the finest of custom made footwear for you. We do not charge for the casting. We only charge for footwear, repairs and accessories. We don't accept casts from anyone else. There are no exceptions, because YOUR feet and MURRAY SPACE SHOE footwear are so important! Alan E. Murray, the inventor of the MURRAY SPACE SHOE, was a professional ice skater and his wife, the co-inventor, Lucile Marsh Murray, was a dancer and was involved in physical therapy. In spite of Alan E. Murray's two broken legs, he stuck with skating for 20 years. He sampled all the various makes of shoes on the market, but corns, calluses, hammer toes and falling metatarsal arches persisted, and so he began his search for "foot health". His first inspiration came to him while he was sitting in a dentist's chair having a mold made of his tooth. Why could he not make a shoe from a mold or cast of the foot? So, began years of experimentation and trial and error before he arrived at the process that is now used to get a mold or cast of the foot and make a shoe "to fit the foot" or as Mr. Murray called it, the IDEAL SHOE. As professionals who had to use their feet, Mr. And Mrs. Murray knew the shoe must provide stability, be properly aligned, and provide space for the foot to function as nature intended. We don’t squeeze your feet into an arbitrarily lasted shoe. We build a shoe for comfort! That is what we sell! First, we take a cast of both of your feet and get the exact replica of your feet. Then, we mold all the materials around the replica of your feet so that when the shoe is finished, it will fit the foot. In casting, we capture your arch (whatever it is) and all the contours of your foot so that when you get your shoes, they are the shape of your feet. In other words, the foot makes the shape of the shoe. We also give you extra cushion underneath your feet, which is contoured just like your feet. 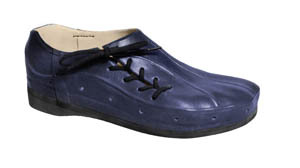 Example, diabetics who have ulcerated areas need deeper shoes using Plastazote or other similar materials as the inner sole for extra cushioning. We have several different types of insert materials varying in thickness and softness and firmness. We select the one that fits your particular needs. Additionally, the weight of your body is evenly distributed over the bottom of the foot so there are no pressure areas and there is sufficient cushioning between the bottom of your feet and the hard surfaces upon which you walk, allowing you to stand for many hours without fatiguing. We use the best leathers we can obtain for our work, generally, cow and kid. We have a wide range of colors and we assist you in selecting the best leather or cloth for your particular needs and desires. Generally, we recommend people start out with a Basic, Plain or Moccasin style shoe as they give the maximum support and also are the least expensive. We also have sandals and boots. If you wish more information, call, write or come see our display of samples and show us your feet. We require appointments so that we can serve you properly. 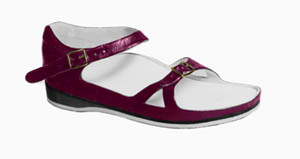 Comfortable shoes, comfortable boots, comfortable sandals are the specialty of Murray Space Shoe.